A few weeks ago, we fired our seller at the bakery. Unfortunately for us, his replacement stood us up on his first day of work and was nowhere to be found. He just... disappeared! We interviewed another potentiable and he agreed to come in for training. But we were stood up. I couldn't help but rant online. Diba? 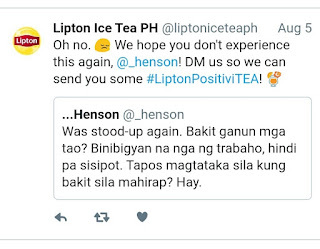 Nakaka-frustrate? The next day, I received a tweet! Fast forward to this evening, I saw this in my room! I wanted to save it for a bad day... but I couldn't resist. Haha! Inside were three different ice tea flavors and a cute tumbler. This was definitely a happy humpday surprise. 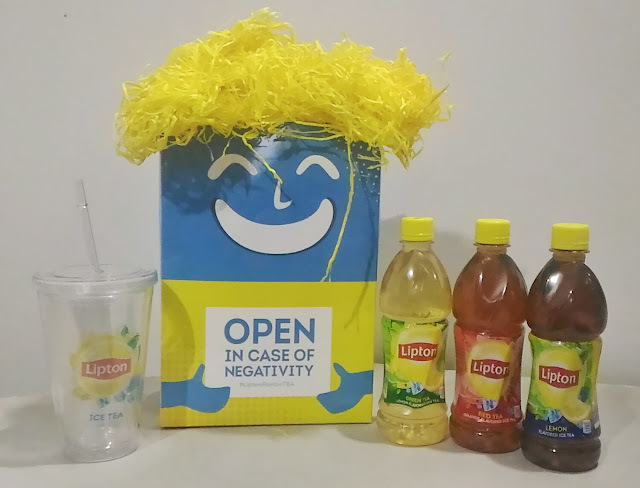 Thank you to Lipton Philippines for sending over some positiviTEA! No negativity tonight. 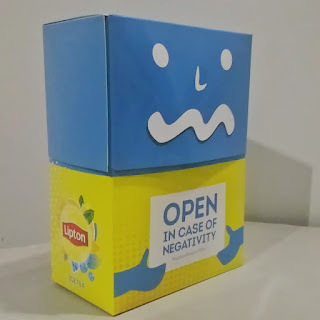 To add to the positiviTEA, we have a new seller already! Tengksgad! Hi Mari, Actually the yellow confetti was inside the box and was used as cushion for the products. Nilagay ko lang sa taas para kunwaring buhok. Hehe.